About the Book: After the unprecedented violence of the 1864 Overland Campaign, Union Lt. Gen. Ulysses S. Grant turned his gaze south of Richmond to Petersburg, where the railroads that supplied the Confederate capital and its defenders found their junction. Nine grueling months of constant maneuver and combat around the “Cockade City” followed. Massive fortifications dominated the landscape, and both armies frequently pushed each other to the brink of disaster. 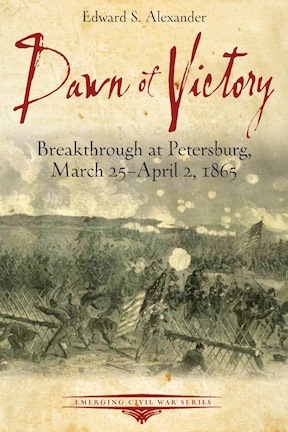 Dawn of Victory: Breakthrough at Petersburg tells the story of the men who fought and died in the decisive battle of the Petersburg Campaign. Readers can follow the footsteps of the resolute Union attackers and stand in the shoes of the obstinate Confederate defenders as their actions decided the fate of the nation. About the Author: Edward S. Alexander is a park ranger at Pamplin Historical Park and the National Museum of the Civil War Soldier, site of the Breakthrough Battlefield in Petersburg, Virginia. His work in preserving, maintaining, and interpreting these grounds allows him to guide readers across this hallowed ground. Edward is a graduate of the University of Illinois with a B.A. in history. He has previously worked with Fredericksburg and Spotsylvania National Military Park and the Illinois Department of Natural Resources. He is also a contributing historian at Emerging Civil War (www.emergingcivilwar.com).